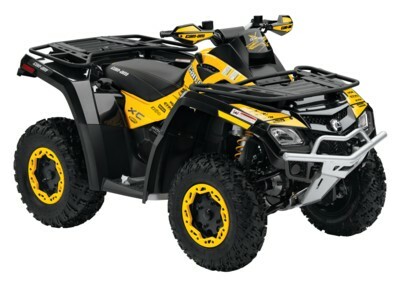 BRP’s 2011 Can-Am ATV line-up features two new ATV models with upgrades to existing models. The Can-Am Outlander 800R X xc and the Can-Am Outlander 800R X mr bring the success of BRP's X-Package concept to its popular Outlander line of recreational-utility ATVs. "The expansion of our popular X-Package concept to the Can-Am Outlander 800R is a natural progression as we bring more to the ATV enthusiast," said Yves Leduc, vice president and general manager, North American division. "Two important customer segments are addressed with these two new models. For the aggressive trail rider and the weekend warrior we have the Outlander 800R X xc and for the mud-riding enthusiast we offer the most complete and advanced mud-specific ATV the industry with the Outlander 800R X mr," added Leduc. The Outlander 800R X xc model was developed closely with Can-Am racers and race-team partner companies in the Can-Am Grand National Cross Country (GNCC) series. After multiple championships in the GNCC race series BRP has taken valuable feedback from this strenuous form of off-road racing to develop the Outlander X xc ATV. Both the racer and the aggressive trail rider see a direct benefit of the racing experience in this model. For the mud-riding enthusiast, the Can-Am Outlander 800R X mr represents the most-advanced mud-specific ATV the industry has ever seen. Developed closely with Gorilla Axle, a leading company in mud riding and racing, this ATV has a variety of features that make it the clear choice for the mud rider. At the heart of the machine is the Can-Am-Exclusive Air-Controlled Suspension (ACS™), which allows the rider to adjust the ground clearance of the machine. With ACS, the mud rider no longer has to sacrifice comfort for ground clearance. BRP engineers did not stop there. The radiator has been relocated above the front rack for the ultimate in mud performance and a seamlessly integrated snorkel system places critical intakes to the highest point on the ATV. Finally, the Can-Am Outlander 800R X mr comes equipped with 30-inch Gorilla Axle Silverback tires making it ready to tackle the deepest mud holes. Can-Am also highlighted changes to its graphics across its ATV line with new color offerings. For 2011, Can-Am has gone to a more streamlined graphic approach across its ATV line and has a new white coloration for its Renegade™ ATV line. Finally, the Outlander XT-P line gets the addition of a sleek silver and black coloration package.